Israel, this is insanity. And abject failure. 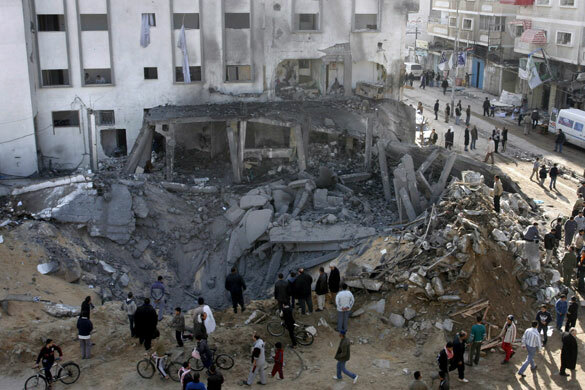 The aftermath of an Israeli air raid in Gaza, 2009. For as long as I can remember, Israel has been saying that it was going to do “whatever it takes” to stop Palestinian terrorism. On Thursday, an Israeli bus filled with kids was hit by an anti-tank missile fired out of Gaza. Two were injured, including a 16 year old boy who may well die of his injuries; there is some indication that those who fired on the bus knew that it was transporting students. The Israeli military responded with intensified bombing of the Gaza Strip (it should be noted that Israel frequently runs bombing raids over Gaza, sometimes in direct response to violence, sometimes not, and has in fact been strafing Gaza off and on over the past several weeks at least), resulting in five Palestinians killed, including a 50 year old man, and five injured, including a young child. This cannot be allowed to continue…. We will have to catch [Hamas members], to tear them apart, to chop them to pieces. This is what I’m certain the Israel Defense Forces and the security service will do. I remember that bombing particularly well, because I reported on it. I remember hearing these official Israeli responses, over and over again, during those horrible years of suicide terrorism, and watching the IDF tear into the Gaza Strip and West Bank, over and over again. Very little — not to say nothing — has changed in the intervening years. Consider the much-forgotten War-In-All-But-Name “Operation Summer Rains” (summer 2006), when Israel responded to the capture of one of its soldiers by decimating the Gaza Strip from the air, destroying roads and bridges as well as the Strip’s single power plant, and killing 202 Palestinians (five Israeli soldiers were killed) — all in an effort to win release of the soldier (Gilad Shalit, held by Hamas to this day), and prevent the firing of rockets from Gaza. Consider further the It’s-Really-A-War-This-Time “Operation Cast Lead” (winter 2008/2009), in the course of which Israel bombed the Palestinian Justice Ministry, Legislative Assembly and Education Ministry, among thousands of other structures, and killed 1,396 Palestinians, 763 of whom were noncombatants, including 344 minors — all in an effort to “break Hamas resistance” (six Israeli soldiers were killed, as were three Israeli civilians). Then cut to the Jerusalem bus bombing just last month, and Israel’s response (Netanyahu: “Israel will react firmly”, followed by more bombings of, and deaths in, Gaza). Even if we put aside, for the moment, the staggering moral implications of the occupation, the settlement project, and the wildly disproportionate violence that Israel has wreaked on the Palestinian people as a matter of course in this decades-long war (and let’s call it an on-going war, please, because that’s what it is), as I look back on nearly two decades of Israel’s responses to Hamas violence, I can only come to one conclusion. Time, and time, and time again, Israel has gone into Gaza (and, in the past, the West Bank) and torn the Palestinian people and its institutions to bloody shreds in an effort to stop Hamas — and yok. Nothing. Abject failure. Israelis are not secure. Israelis do not live in peace. Israelis do not know that they will be able to raise their children to adulthood without sending them into a meatgrinder on the way — on the contrary, Israelis tend to assume that the next war is just a matter of time. So, fine. Forget the Palestinians. I know I said just two weeks ago that Israelis have to recognize Palestinian humanity, but for the sake of argument: Screw that. Thousands of Palestinians bodies don’t matter. A decimated economy and ruined infrastructure don’t matter. All that matters is Israeli security. And everything that Israel has done for 44 years has failed to deliver just that. Insanity, it’s said, is the act of doing the same thing over and over and expecting different results. But I’m the crazy one for suggesting peace. Notes from the post-Republican underground – Dear Democratic base, part II. Every once and awhile I string several stories together and look at more than one set of casualties, and it’s just overwhelming. Some years ago I read an analysis by an Israeli who was advocating for peace in the region. He pointed out that the reason Jews founded the modern State of Israel in the first place was so that they could have a place where they could live in peace and security. (This was right after WWII.) And he further pointed out what you have said: they have, so far, failed. I will never understand the “wisdom” of a proportional response. Because those proportional responses tend to be very disproportionate, and always on the people who don’t deserve them.